WASHINGTON, D.C. -- With a new medical study this week asserting that vitamins do not provide health benefits and may even cause harm, a Gallup poll conducted earlier this month shows that half of Americans report regularly taking vitamins or other mineral supplements. The study, published in the Annals of Internal Medicine on Tuesday, was accompanied by an editorial titled, "Enough Is Enough: Stop Wasting Money on Vitamin and Mineral Supplements." "The message is simple," the editorial asserted. "Most supplements do not prevent chronic disease or death, their use is not justified, and they should be avoided." Vitamin sales total nearly $12 billion annually. There is a significant generation gap between those who use vitamins and those who do not. 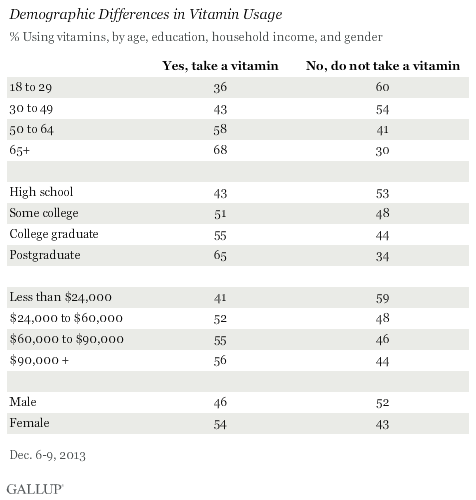 About one-third of 18- to 29-year-olds say they regularly take vitamins or mineral supplements. Vitamin use increases among older Americans, with regular use climbing higher than 50% in the 50 to 64 age group and continuing upward to encompass a solid majority of seniors (68%). Vitamin use also rises with education. Forty-three percent of those with no more than a high school education say they take vitamins regularly, but vitamin use steadily rises with college experience. Regular vitamin use also increases with income. A majority of those making less than $24,000 per year do not take vitamins, but a majority of all other income categories take vitamins, topping out at 56% for those whose household income is $90,000 or more per year. A majority of women (54%) say they take vitamins or mineral supplements regularly, yet only 46% of men say they take them. Factors that may contribute to the disparity include women taking more prenatal vitamins or calcium supplements for those who suffer from osteoporosis. For hundreds of years, foods and beverages have been known to contain vitamins, but only in the last century have multivitamins and other nutritional supplements become available for purchase and consumption. Since then, the use of vitamin supplements has been controversial. Despite this, half of American adults today take vitamins, including as many as two-thirds of older Americans and those with high levels of education. With so much money at stake, recent findings in the medical field are bound to be points of contention for some time to come. The potential exists for disruption of a multibillion-dollar industry and the alteration of lifelong habits of millions of Americans. 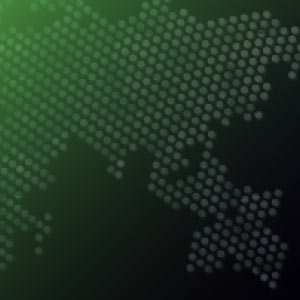 Results for this Gallup poll are based on telephone interviews conducted Dec. 6-9, 2013, on the Gallup Daily tracking survey, with a random sample of 2,023 adults, aged 18 and older, living in all 50 U.S. states and the District of Columbia.